It is a cold winter morning in the plant. On the request of the top management, the plant head has called all his divisional heads for a meeting with a consultant of a renowned firm in the city. The consultant meticulously dressed in his business formals gently opens his laptop and starts the presentation. The moment he talks about cyber-physical systems and horizontal and vertical connectivity, there is a long silence followed by hushed murmurs. Wait a minute, aren’t we doing it already? I mean what’s so new about Industry 4.0 or Digital Enterprise? Have we not being collecting data for control and automation? SCADA has been around for decades! Don’t we have mathematical models for our processes and plants? Don’t we have our ERP systems that trace all our business transactions? Then why invest on another technology? What’s the big deal about going digital? These are questions that baffle the manufacturing staff. And then the consultant shows slides after slides on how data analytics and statistical modelling can reduce costs and lead times. The quality head shakes his head disappointedly. He has been working with this kind of data for almost a decade now since he implemented Six Sigma and Design of Experiments. It seems as if the age-old technologies have been repackaged using some new terminology; old wine in the new bottle! So why should we take it seriously anyway? There have been two major disciplines in the manufacturing environment – Analysis and Control. The analysis discipline is led by the QA teams that analyze data to find gaps in the processes and run continuous improvement programs for manufacturing excellence. The Control discipline would be focused on real-time monitoring of the process and controlling it around the given set-point. So far, the two disciplines work in different contexts and time frames. The control discipline works in real-time with localized focus on one workstation or one process or one line. The analysis discipline works across the lines but not in real-time. Typical Manufacturing IT and MES systems enable recording of information from production floor in central dashboards. This information is diagnostic in nature with little real-time prognosis application. This means that these systems can only ‘record’ an error rather than using this information to compensate it in the later stages or reject the part early on to save further processing costs. For example, until now, the material flow was disconnected from the information flow. The information that we have been capturing and analyzing was essentially from the past. Whatever insights we have gained from one part cannot be applied to another one because it has its own distinct variations in its characteristics and machine and process parameters. Hence, any information that we have captured and analyzed for one part loses its context for another part. This means the knowledge that we are generating is generic rather than contextual. In a responsive enterprise, the information and material needs to be so tightly coupled that the information flows along with the material. Hence, the insight gained from a part is instantaneous and contextual because it can be used on the same part the very next moment. If we continuously acquire every parameter of the material, assets and the process at every point in time, we can not only predict the output, we can also control it. For a smarter manufacturing process, the systems have to be prescriptive rather than diagnostic. Suppose an engine block has a negative deviation in its bore diameter. Can it be compensated somewhere down the line during the machining? Could piston be made smaller to fit into this block without compromising on the performance? If yes, the system will implement these compensations at respective station when the particular component reaches it. Suppose a component got wrongly assembled or machined for the given variant. Could it be used in another variant AS-IS or after re-machining? Could it be used in another sub-system? If yes, it will be sent to the respective line or stored in WIP for re-use. If it has developed a defect that can neither be compensated nor reused, it will be rejected early to save additional costs. What would happen if the raw material costs surge by 20%? What would happen if demand drops by 15%? How should the manufacturing process be adjusted to compensate this change? Manufacturing intelligence system will simulate and emulate these business scenarios to improve organizational responsiveness for sudden changes in the business environment. What happens when aggregator comes between you and your customers and erodes your margin? What happens if technology changes or product becomes irrelevant to your current customer base? What happens if the supplier of one of the key component decides to withdraw it? The system will emulate the impact of changing components, technology, features, design or the number of variants on the costs, quality and lead times. Traditionally, there have been three primary areas for building competitive advantages – Operational Excellence, Product leadership and customer intimacy. A company was expected to excel in one of these three and perform acceptably in others. Hence, the majority of corporate projects were focused on strengthening the competencies around one or maximum two competitive advantage. However, recently the customers have become much more demanding and require companies to perform equally on all three counts. This means companies need to work on their strengths and weaknesses simultaneously and even then it could end up facing a crisis situation due to volatility and competition in the global markets. And when an organization undergoes a crisis, not many leaders are prepared and geared up to lead in the face of an imminent threat. And this is why the internal leadership crisis hurts organizations more often rather than the external factors. Building the ability to handle such difficult scenarios is not easy. It requires continuous training and practice to develop once survival instincts. A martial artist trains his mind and body by emulating different threat scenarios and practicing his response till he can fight instinctively. This happens because these skills get ingrained in his reflexes and muscle memory. In a similar way, even an organization needs to continuously envisage various threat scenarios and emulate them to build instinctive responsiveness to handle crisis. These organizational instincts can only be developed through a firm commitment and tenacity to build the necessary capabilities and infrastructure and deploy the right resources. If an organization rigorously works its survival instincts, it will not only sail through downturns, it might even use it to build a sustained competitive advantage. As I am publishing this post, Hon’ble Chancellor of Germany, Ms. Merkel and Hon’ble Prime Minister of India Mr. Modi are visiting Bosch India to discuss the Indo-German collaboration and foster ties on ‘Digital India’ and ‘Make in India’. There cannot be a better time for the growth of manufacturing in India! The government of India has launched its most ambitious national program ‘Make in India’ to make India a global manufacturing and investment destination and to increase the share of manufacturing in the Indian GDP. In order to achieve its objectives and become relevant in manufacturing sector, India needs to address the new global market realities and global supply chain challenges. These new market realities have created unique challenges for the traditional manufacturing organizations across the value chain. These challenges cannot be solved by the traditional manufacturing system. Manufacturing economies of the world have so far relied on supply chain optimization, enterprise IT, cheap labor and mass production to be cost effective. However, these techniques are not sufficient to address the new challenges. These require a new architecture that can extend the enterprise information framework to physical things and processes and seamlessly harmonizes both material and information across the supply chain. Industry 4.0 offers such an architecture using cyber-physical systems, cloud and big data analytics to create new capabilities that unify everything in the manufacturing infrastructure. Industry 4.0 is about streamlining decision making by keeping human element only at critical nodes. Globally, businesses are relying on data analytics to predict demand patterns and flexible manufacturing to quickly respond to these patterns. The next generation manufacturing destinations will need to have these advanced capabilities to solve complex business challenges. And this would require investments in the information assets and digitization of manufacturing in the country. Compared to other manufacturing economies in APAC and ASEAN, India is uniquely positioned as a large knowledge and information hub with stable economy and skilled manpower. But if we do not invest in Industry 4.0 technology, India will forever be catching-up with other manufacturing economies of the world. The government of India has already initiated projects like Delhi-Mumbai Industrial Corridor (DMIC) with dedicated railway freight corridor (DFC) and multiple new manufacturing cities, logistic hubs and smart residential townships along the DFC. But the contract manufacturing industry in India is still in its infancy and has neither the capacity nor the capability to serve the global clientele. For ‘Make in India’ to be successful, it is imperative that the Indian manufacturing sector becomes aware of these changing dynamics and invests in building Industry 4.0 manufacturing capacity in India. Without the collaborated and concentrated effort by both the government and industry, ‘Make in India’ would remain just a distant dream. Smart Homes is not really a new thing. Home Automation is being marketed under different names for many decades now. ‘Soon Homeowners Will Be Able To Control All Home Appliances Through A Central System’ was the title of a Chicago Tribune article released in 1989. In fact the term ‘Smart House’ was coined as early as 1984 by the American Association of House Builders. Prior to that, In 1966 Jim Sutherland, an engineer working for Westinghouse Electric, developed a home automation system called “ECHO IV”; this was a private project and never commercialized. There are several reasons why home automation technology could not become a commercial success. The first and foremost reason is technology adoption among the masses. Before the evolution of smart phones, it was unusual for the masses to adopt the technology of the time. The human machine interfaces were complex and the system design required technical know-how. The invention of touchscreen changed that overnight. It provided simple and intuitive human machine interface and led the technology adoption through the development of ‘apps’. The second reason was the machine to machine communication and information technology of the time. The cost of technology was so high that it could not permeate the grass-root level appliances used by the masses. This significantly reduced the utility of the automation systems. Another aspect was standardization of communication technology. Prior to the adoption of Ethernet and IP protocol, the communication technologies for machine to machine communication were being developed in silos. Even today, the challenge of standard technology for home automation has not been resolved but we have still covered a lot of distance. Having partially resolved the two major challenges of technology adoptions and standardization, the industry should now be read to the third and most formidable challenge of home automation – marketing it to the masses! For decades now, the smart connected homes were being developed by niche players and were being targeted to the tech savvy upper echelons of the society and the companies soon realized that that segment cannot offer a sustainable mainstream market. The commercialization of internet of things technology has made smart homes affordable to middle class but the problem of marketing still persists. This articles offers segmentation, targeting and positioning (STP) methodology to the home automation industry. 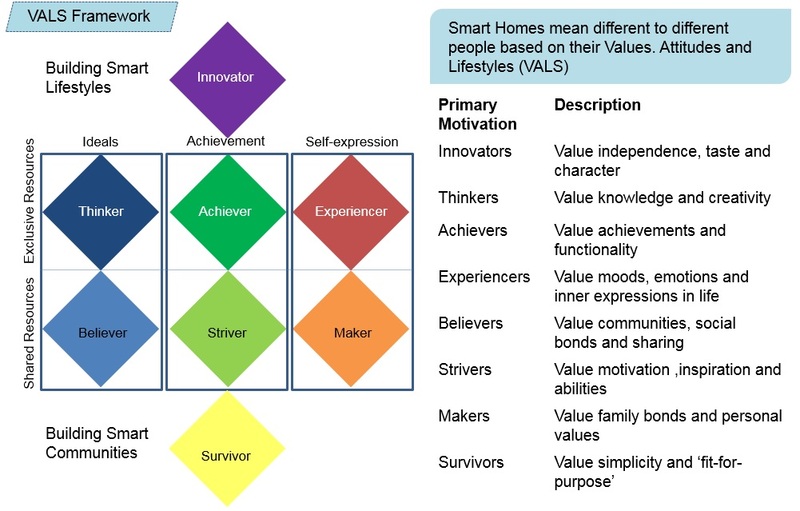 I have used the VALS (Values, Attitudes and Lifestyles) framework for the STP analysis of smart homes. VALS framework has been used because home means different things to different people depending upon their values, attitudes, lifestyles, emotional drivers and resources and VALS framework captures it beautifully. The picture below explains the motivational drivers for different segment of people under VALS segmentation. This framework also make the distinction between smart lifestyles and smart communities depending upon whether the segments prefer exclusive or shared resources. Smart Homes in its colloquial meaning refer to smart lifestyle solutions for high-income, high resources class of people. For the low-income, low resources class, smart communities will be more appealing because of its lower total cost of ownership. 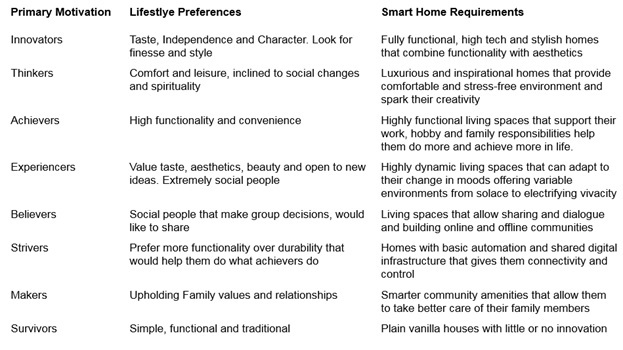 Based on this distinction, the home automation preferences for different segments are described below. Based on these smart home/community preferences, the home automation industry can develop smart home concepts that appeal to the individual preferences and desires of different segment of people. This approach will make smart homes not only more acceptable for the masses but also more meaningful and relevant to their lives. Businesses around the globe have become more and more complex over the years. The complexity arises due to multiple touch-points at which various people, IT and enterprise systems interact with each other. With ever expanding breadth of supply chains, more and more companies are becoming tightly interdependent across the value chain. It is the unpredictable interaction of these independent systems that creates complex challenges in businesses. These complex business challenges have multiple layers, multiple perspectives and multiple constraints that cannot be solved by traditional means. The lowest common denominator for these complex problems are the information that is being collected, communicated and transferred for various people and systems to act upon. And it is because of the challenges in managing this information; these complex problems can neither be expressed with certainty nor be addressed effectively by the traditional means. A problem whose solution requires a great number of people to change their mindsets and behavior is likely to be a wicked problem. Wicked problems crop up whenever the organization faces constant change or unprecedented challenges. Business problems are not just systemic problems; they are also affected by the mindsets, beliefs, attitudes and behaviors of the people involved. If we recall the Nash equilibrium, the most optimum solution may not be achieved if all the parties get their best alternative. The optimum solutions are obtained only when all the stakeholders agree to compromise for the next best alternative. Hence these problems have multiple layers to it that encompasses processes, systems, behaviors, attitudes and mindsets. For such wicked problems, the general thrust of the problem may be clear, however considerable time and effort needs to be spent in order to map these problems clearly and decouple problems from systems and people involvesd. A large part of the problem solving activity, then, consists of problem definition and problem shaping. So how do you really define your problems? Business systems and processes rely on the information that is being generated by business operations. Various people in the organization consume, transform and create information that goes into the data systems. Hence, the information becomes base for functioning of the entire business enterprise ecosystem. If we assume that all the actors in the ecosystem are perfectly aligning their actions with their information, we can express the anomalies in the business as a function of information. All systems, processes and people can be represented in the information domain by mapping how they work with information. Transforming business problems into information domain allows us to express them clearly and develop effective solutions. IoT based solutions provide unique strengths and advantages when it comes to solving complex information problems. Firstly, IoT is really an information framework that is well equipped to extract information from multiple sources and streamlining it across enterprise. Any information that is not available can be acquired using plug and play data acquisition systems. Secondly, the architecture itself is so modular and scalable that it doesn’t need extensive setups. A few IP-enabled sensors at critical points and an IP internet gateway can get you started with your solution. Thirdly, IoT solutions are highly configurable that allows you to freely experiment with different designs and configurations. Fourthly, since data processing happens at the highest level, IoT solutions can theoretically be linked with any other IT system in an enterprise. Hence, IoT based solutions can enable development of multi-tier solutions for complex information challenges in the business context. In order to solve complex information problems, we first need to transform and map it into simpler connected problem components that can be addressed by different layers of IoT architecture. This approach is very similar to the Fourier transform where a complex signal is first distilled into its base frequencies in the frequency domain. Later, a linear multistage solution is developed to address these individual frequencies as desired. Some frequencies are amplified, some are attenuated and others are altogether eliminated. This solution is then transformed back to the original domain and implemented with physical components. A similar approach can be applied to business problems by transforming in the information domain and solving them using IoT architecture. First step in the solution approach is to define frames of reference. Business problems involve multiple stakeholders operating under their unique desires and motivations and the solution must consider existing systems and behaviors. Brilliant solutions fail to generate results because of human related issues. A solution can have a higher success rate if it fits into current systems and behavior patterns and if steps are taken to systematically transform these systems and behaviors. Hence, it is imperative that solution design process and solutions are people and systems centric. The next step is to transform the problem from complex monolith to a set of layered interconnected simple problems that can be addressed effectively. People and systems in an enterprise work with information that is available to them. If we consider these people and systems as information processing nodes that collect process and transfer information, we can create an information map representing these systems and people by different types of nodes. Typical information transformations consist of information generation and collection, information sharing between nodes and logical flow of information in business processes. This representation exposes information gaps in the business problems that can be used for creating an solution blueprint using IoT information framework. The solution blueprint consists of gap analysis on the IoT framework where different solution elements are recommended for different aspects of the problem. The M2M and cloud layers of IoT framework aggregate data from different sources and cluster them logically to solve the information acquisition aspect. The connectivity and mobility layers of IoT can define the message integrity and format for point-to-point communication problems. Finally, the ERP and applications layer of the IoT Solution can address the flow problems by maintaining correct routing of information and sequence of events. The final blueprint will recommend new IoT systems that will be required for the solution. The IoT solution blueprint designed in the earlier step needs to be translated and integrated into the original environment by defining new roles, processes and systems. The solution will define the new roles for all relevant stakeholders and develop a change management plan to transform current behaviors. Similarly, based on the new data clusters, workflows and roles, solution will define the new systems and processes that will be required to solve the complex problem. Business problems can be represented as information problems by creating information maps using various systems and people as information processing nodes. These information maps will highlight the information gaps through IoT solution framework. The solution blueprint will recommend methods and tools to streamline information asymmetry. This problem solving approach focuses on customers’ business problems rather than the technology itself. IoT could be a great tool in a business consultant’s toolbox. And this approach utilizes the strengths of IoT in solving real business problems where the value of IoT can be appreciated. It is true that rise of the digital megacities in inevitable and many cities have already begun that journey. Most of these cities are taking the digital route because they are becoming too big to manage. In that sense, smart city initiative can be seen as a massive attempt by the city governments to seize control of their territory. The various avenues of smart cities cover smart governance, smart buildings, smart mobility, smart healthcare, smart infrastructure, smart economy, smart citizens etc. In each of these avenues, the citizens are often seen as passive recipients of technology rather than active participants. Even the word ‘smart citizen’ refers simply to ‘a better informed citizen’ not ‘a better empowered citizen’. What we forget is that city is not just a random group of people; rather a city is a host to connected communities that share similar culture and lifestyles. While all of us are talking big on smart cities, have we really understood what would they mean for the people? What city truly needs today is harmony and oneness; harmony in its governance, systems and processes and oneness in its people. In the shroud of technology, the real essence of the smart city project is often pushed to the backburner – community development, participatory governance and sustainability. The first and foremost goal of a smart city is to listen to its people more effectively and the most important stakeholder in a smart city concept is the communities inhabiting the cities. The core objective of a smart city project must be to ensure a strategic alignment between the governance and the socio-economic needs and aspiration of the inhabitants. Without this alignment, smart city project gets reduced to an IT project for operational efficiency. Isn’t this how most of us perceive smart cities? The purpose of community collaboration is to engage in a dialogue about the community’s needs and collectively agree upon goals, which can then be used to explore how technology may be applied to achieve those goals. It opens the platform for different communities to represent their needs and collectively shape a common policy aimed at achieving the larger city goals. The result of this exercise is to bring a strong sense of identity and belonging among the city inhabitants and foster stronger bonding, sharing, oneness and harmony. Another important pillar of the smart city concept is the participatory governance. A paradigm shift is needed for decentralization of governance enabling higher public participation and higher accountability and responsibility in government divisions. Today’s urban challenges are far more complex to be addressed by one entity centrally. The only way to solve such complex issues is to transform, segregate and map it into multiple layers of simple problems and then develop a multi-tier solution approach. An example that comes to mind is from the domain of digital signal processing. A complex signal is never addressed in AS-IS form. These signals are subjected to ‘Fourier transform’ that translates it into a series of simple sine waves with different frequencies that can be individually analyzed and easily addressed using linear multitier filters. The smart city systems should play the role of Fourier transform in decomposing complex problems into simple problems and map them to multitier systems and processes. This will allow the citizen committees to handle the simple problems and enable different governments to handle higher level problems. This type of structured collaboration between citizens and governments allow mature processes and systems, faster escalations, defined accountability, faster resolution of problems and greater bonding between stakeholders. The rate at which we are consuming resource is alarming and definitely not sustainable. Our present consumption culture is contributing to socio-economic disparity and complicating urban challenges. We have learnt to stock up things that we either do not need or need occasionally. On one hand consumerism is creating an illusion of abundance; on the other hand it is inciting insecurity and fear. Consumerism aggravates resource and infrastructure shortage and leads to wastage. A lot of our unutilized resources can be shared and a lot of what we waste can be redistributed. This way a city can flourish and support its inhabitants with much lesser resources. Unfortunately, today, we lack the necessary systems and infrastructure to share assets and redistribute wastage to the needy. Our concept of smart city must recognize these wastage and provide solutions to utilize these underutilized resources. As citizens, we need to understand the consequences of this voracious hunger and need to consume. A city needs to preserve its resources and smart city technology is our great opportunity to mend our lifestyles and our relationship with each other, our society, humanity and Mother Earth. To summarize, smart city needs to connect us all at the human level and address real challenges that the people are facing. The challenges of community development, participatory governance and sustainability are some of the great urban challenges of our time and smart city technology has the answers for most of them provided we work on it together. Without this intent, the smart cities project loses its meaning and relevance and becomes just another IT project. IoT presents companies unprecedented opportunities to transform their existing businesses and create some new ones. However, with the plethora of platforms and solutions available, most companies are keeping their fingers crossed and evaluating if it is a real game-changer or just another fad. In my previous article, I have highlighted reasons why IoT is here to stay and change our lives forever. In this article, I will discuss eight steps for successfully implementing IoT strategy and practices in any organization. While it is important to think long-term, the variety of offerings in the IoT domain can lead you to an analysis-paralysis. The idea is not to go big-bang into IoT but to slowly merge IoT into your operations to gain higher marginal returns. Addressing specific burning issues in your operations and solving them with simple solutions will result in lower cash outflow and faster benefit realization. One of the South-East Asian auto OEM that I am working with is doing this brilliantly. They have identified one burning issue – Traceability of a critical component in one assembly line as their pilot IoT application and they are now building scalable solution for that problem. This solution is a economical solution which one validated can be rolled out to other critical components and other lines. This first success will also allow them to expand to other higher order problems as they gain more and more expertise with IoT solutions. If you wait too long that perfect, stable IoT platform, you will lose on the competitive edge that you might get today. Moreover, you will be caught in the Catch-22 situation because the platforms can only stabilize once a critical mass starts adopting the IoT discipline. A better strategy would be to setup a small in-house technical team that can work with start-ups to develop simple IoT solutions for targeted problems. The teams can chose 2 or 3 such problems and experiment with different technology and products combinations. The starter versions of these products are available at nominal costs and at times even free. The in-house teams can develop multiple working prototypes in a shorter turnaround time in order to fail faster, fail often and fail cheaper. And the experience that they will gain through these exercises will provide them excellent learning and hands-on experience to develop long-term IoT roadmap for the company. I have argued in my earlier posts that the real value of IoT is neither in the ‘Things’ nor in the platforms. The real deal lies in the ‘data’ that gets captured and processed to give insights. The IoT is really an information framework that uses real-life and real-time data to drive innovations in a company. Many companies today are trying to push technologies rather than identifying the applications. This is putting the cart before the horse. On the contrary, if you first build your IoT framework by defining what data you really need and where can you find it, deploying the appropriate technology becomes very easy. Improvements come when technology supports behaviors but breakthroughs come when technology transforms the behavior. We have seen this in the telecom industry with the advent of touch-screen phones. If you really want to make IoT successful in your company, make sure your people accept it, adopt it and use it. Otherwise, it will end up becoming just another tool which nobody wants. Since, IoT is data-driven; the benefit can only be realized by regular usage in day-to-day operations. Further applications can be then derived from these people based on their experiences. The value of IoT will be realized if the data that is being processed is actually put to use in the decision making. Our human minds take some time to get used to new forms of data. Hence, it is important to deliberately create ‘decision nodes’ that utilize the IoT data. E.g. if you are monitoring movement of an asset in your plant or workshop, make sure it is connected to some KPI on asset management so that supervisors start using this information in their reporting and managers start using it their decision making. This is a critical step for overall business transformation. While companies traditionally use ROI for evaluating various projects, IoT requires a focus on ‘returns to scale’. This is because the IoT returns are governed by Metcalfe’s law and hence is a function of ‘scale’ rather than time. At a machine level, returns will be minimal and will remain so for a long period of time but as you increase the scale to plant level or value chain level, returns will be become phenomenal. Hence, the IoT strategy should clearly define the scale of deployment while calculating the returns. When a company embarks on the IoT journey, it is possible to lose focus and get lost. Hence, it is extremely important to clearly define the key milestones for IoT deployment and match them up with corresponding technology framework and investment plans. These milestones should be defined based on the desired scale of deployment, estimated costs and expected marginal returns. This will not only help you in prioritizing IoT applications, but will also ensure that the technology platforms also keep up with the scale. Finally, as people and processes mature with your IoT roadmap, you should invest on finding new sources of creating value. The IoT information framework should be utilized to discover patterns and explore new opportunities to innovate business processes and business models. This opens up tremendous potential for transforming your business. The tire manufacturer Michelin has collaborated with Accenture to use data from their TPMS (Tire Pressure Monitoring System) to create a fuel economy consulting business for their customers. Similarly, many hospitals are using IoT platform to integrate wellness, prevention and post-treatment care with their core clinical care products and services to offer innovative healthcare offerings to their customers. The motive behind these eight steps is to help you slowly and steadily integrate IoT discipline in your operations and then prepare the solid foundation for business transformation. With today’s cost structures and global inflation, a big-bang approach to IoT may not be feasible. Even if it is feasible for some, it will have inherent technological and operational risks and challenges. Hence, in these circumstances, it is better to adopt a structures and consistent approach to derive value from IoT. In August 2014, Internet of Things reached its peak in the Gartner’s hype cycle for emerging technology report. Around the same time, The Guardian reported that the (IoT) was the most over-hyped technology in development till date. However, just like happiness, hype is contagious! According to market research firm ‘markets & markets’, the Industrial IoT market size is expected to reach $319.62 Billion at a CAGR of 8.15% from 2014 to 2020. McKinsey has estimated that the installed base for Internet of Things devices will grow by 3 billion new devices per annum from 10 billion connected devices to 30 billion devices by 2020. McKinsey has also predicted that this represents a direct growth opportunity that goes beyond almost all other recent innovations with the exception of smartphones. The giants in the hi-tech industry are already betting heavily in IoT and they are trying their best to deliver this unanimous message to the world. While some of them have gotten down to their drawing boards designing new applications, others have gone the crowd-sourcing path by introducing DIY starter kits for general public. The rest of the article also focuses on the growth prospects of ‘Things’ for the silicon vendors. But it seems all that glitters is not gold. A study by the analysts of The Technology Partners (TTP) has concluded that the global companies have made an error in judgement by focussing on IoT. He believes the real values lies in the internet of sensors (IoS) and data that the network can provide. The concept of machines talking to each other is not really a new concept and there are a plethora of industry solutions that do just the same. IoT proponents often refer to the Metcalfe’s law to justify the utility of IoT. Metcalfe’s law only gives the ‘potential utility’ of a network by calculating the number of ‘potential communication channels’. However, the real utility of any network depends upon the number of nodes actually communicating! And for nodes to communicate there has to be an end goal or a purpose that defines why they should communicate. Today, the IoT is simply looked as a technology platform rather than an information framework. It addresses the problem of ‘how’ things should communicate before answering ‘why’ they should communicate. Before ERP, the business activities were considered as mere ‘transactions’ and hence had a lot of gaps and discontinuities. The ERP brought the unifying framework that considered business activities as business processes based on the flow of material, money and information. This framework brought a revolution in the business paradigm and opened channels for supply chain management and other business innovations. The real value of IoT will lie in its power to redefine business processes allowing the companies to gear up for the persistent challenges in their marketing and operations. IoT is really an information framework where it provides the real-time information about our world that we never had before. And it is this information that we need to understand and analyze to solve the gaping problems that industries and governments are facing today. The real solution and the real value lies in the information that ‘Things’ can provide. Everything else is just incidental in making this information available. It is high-time the IoT companies start investing in making this information framework a reality rather than simply pushing technology.